I added a few things to my garden today. Some seeds for forget-me-nots and Lunaria (silver-dollar-plant) are now sowed in the back garden, so there will be something growing there once the tulips are finished. I am in love with the hundreds of pretty violets sprinkled across our front and side lawns, so I dug up a couple for the back garden – they will spread like weeds, which is fine with me. I don’t have a lot of money to spend on perennials right now, so anything I already have and can use is very helpful. I also found some beautiful and sweet-smelling plants growing under the pine trees in the front, so I dug those up and moved them too. 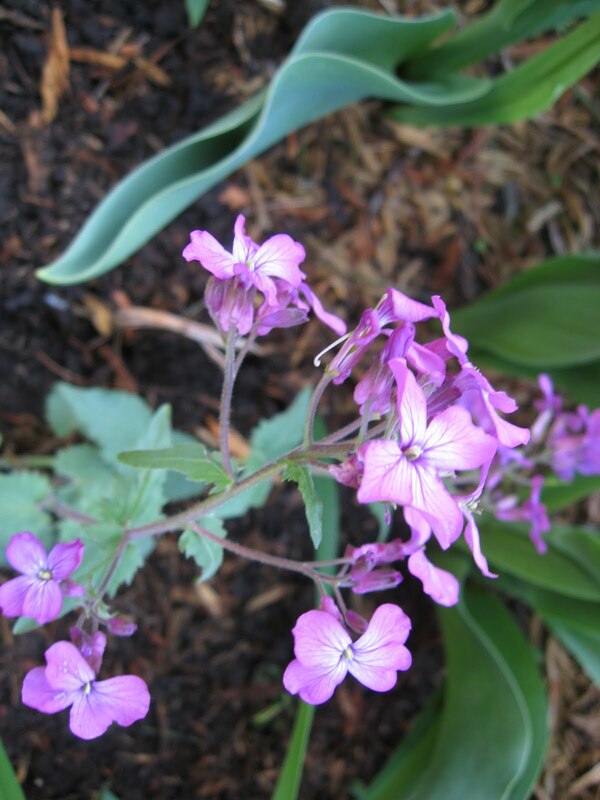 I was sure they were Phlox, but a little research corrected me and now I know they are in fact Hesperis matronalis, or Dame’s Rocket. Technically an invasive weed/wildflower and often confused for native Phlox species, it’s actually outlawed in a few places (Massachusetts, Colorado). As far as I’m concerned, they’re free pretty perennials and so they can live in my garden. I left some under the trees too, because there were a lot of them, and if they’re growing well there it’ll make that area look nice. 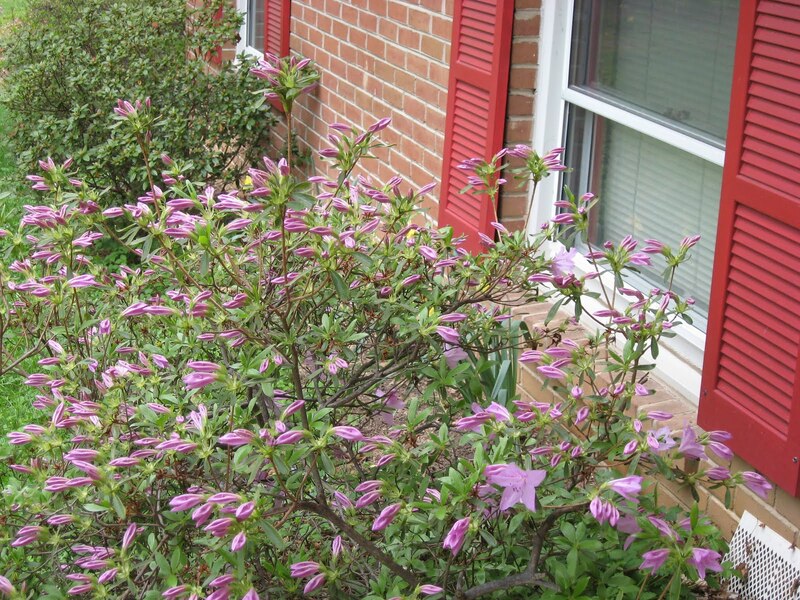 In other news, it turns out that the big azalea by the front door, and the one by the back door, are both pink. The other one in the front of the house is red, and the third one by the gate isn’t flowering yet so I can’t be sure, but the buds look dark so I’m going to guess red. Sadly, they are attracting bees. Billions of bees. So I think I will move them to the side yard in the fall so I can enjoy looking at them from the computer room but not have to dodge bees every time I need to leave the house. The huge rhododendrons we salvaged when the landscaping guys gutted the area under the pines are still alive, and a couple of them are flowering. 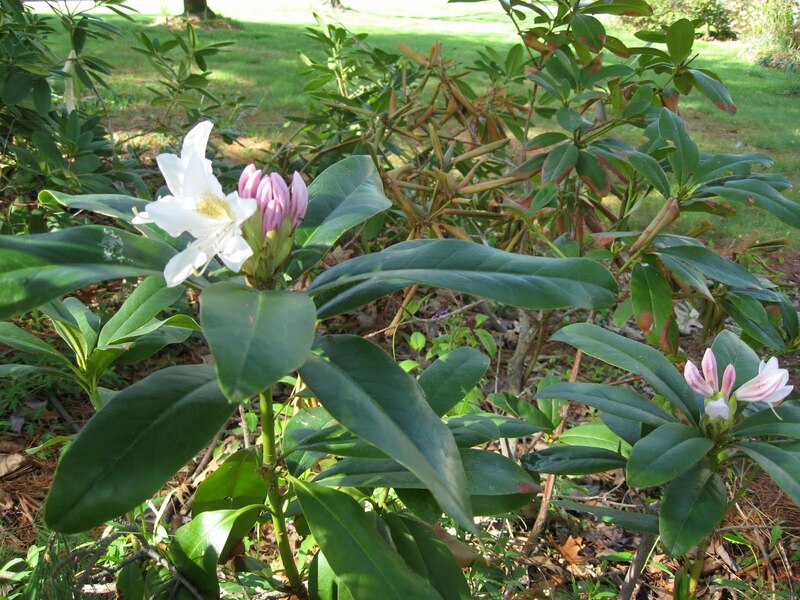 I’ll prune them back after they’re done flowering (the azaleas too), because they’re so gangly and spread out and I want to try and make them fuller and healthier. Or I will kill them by pruning. It’s a fine line! I also moved the tomato plants to bigger pots, and I expect to put them outside within a few weeks. I bought green bean plants too, and will give those a shot in a container garden on the deck, and see if maybe I can grow something edible. A good skill to have in case society collapses around us.